Lisa at Are You My Cousin? 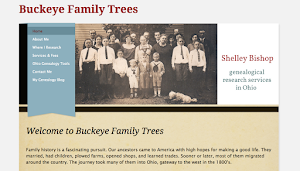 is hosting a Postcard Bonanza, inviting bloggers to share some of their favorite family postcards. What a great idea! Vintage postcards are so much fun, aren’t they? 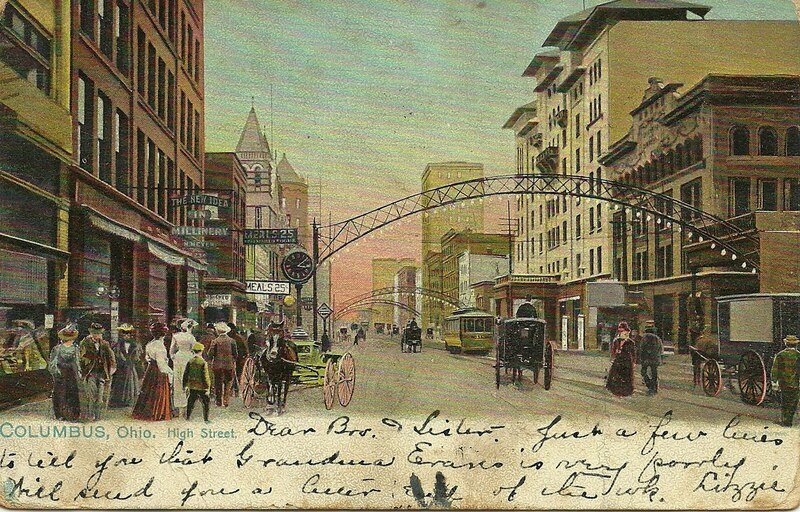 This postcard depicts High Street in Columbus, Ohio around the turn of the century. 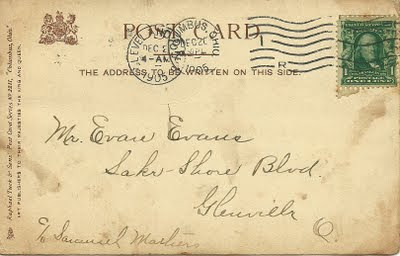 It’s postmarked December 20, 1905. Columbus used to be nicknamed the "Arch City” because of the lighted arches that spanned High Street downtown and northward. You can see one of the streetcars that ran under the arches in this scene, as well as various horse-drawn carriages. Signs advertise “The New Idea in Millinery” at N. Myers and “Meals 25¢” at a nearby diner. The black clock was a familiar fixture for many years. The postcard reads: “Dear Bro. & Sister – Just a few lines to tell you that Grandma Evans is very poorly. Will send you a letter end of the wk. Lizzie” It was addressed to Mr. Evan Evans, Lake Shore Blvd., Glenville, Ohio, c/o Samuel Mathers. Evan was a gardener at the Samuel Mathers estate along the shore of Lake Erie. He later became Mathers’ head groundskeeper. Lizzie Roberts and Evan Evans were the sister and brother of my husband’s great-grandfather, John Evans. 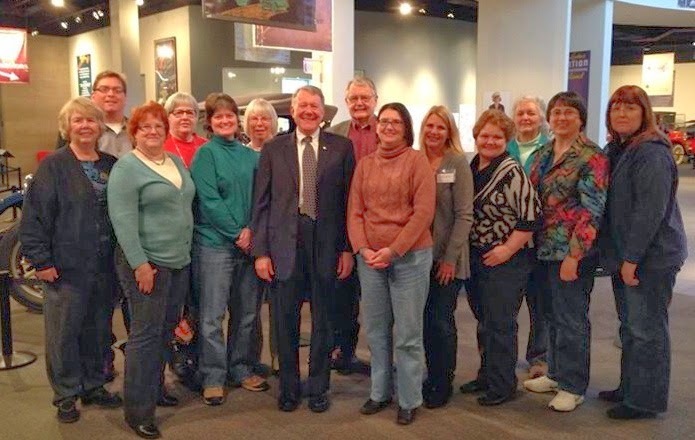 John was a Columbus streetcar conductor. I wonder if his route took him down High Street? My father and grandfather used to own Reeb’s Restaurant, which featured murals of classic Columbus scenes painted on the walls. 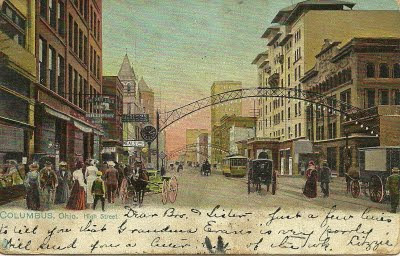 One of the murals portrayed the High Street arches and looked a lot like this postcard. The arches have been recently reconstructed in the Short North district. So a visitor from 1905 might find something familiar in the Columbus of today, after all. If you'd like to know more about the Columbus arches, check out this article by local historian Ed Lentz. Hope you enjoyed this peek into the past! Beautiful postcard! I love the colors. Thanks for joining in the Postcard Bonanza!